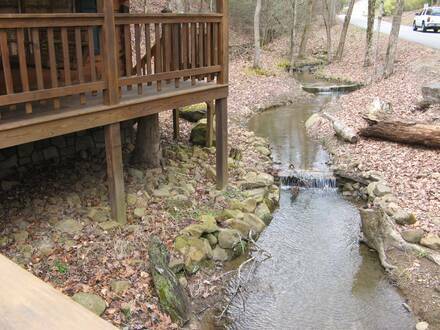 While there are a few cabins in Pigeon Forge near mountain streams, Bear Hugs memorably features its own private footbridge over a babbling brook. Cross over the bridge to enter your fairy-tale castle, pausing to watch the water gush underneath you before admiring the beautiful warm wood cabin with green shutters and door in front of you. Bear Hugs is no less delightful inside than out, with an open living area that feels airy thanks to its high ceilings, but cozy due to its leather sofa and wide fireplace. Start a fire in the stone-flanked hearth and warm your hands on the flames, before cuddling up on the sofa. This one-bedroom cabin is a great spot to celebrate a honeymoon or anniversary, or simply to get some much-needed alone time. Take a book onto the porch swing on the covered front patio and enjoy the crisp morning air. Relax with your sweetheart in the wood-panelled jacuzzi room, which will transport you to a Scandinavian sauna. When you are finished, a king bed awaits. Only 2.5 miles from the Parkway in Pigeon Forge, Bear Hugs is a lovely space to which to return after a fun day hiking in the Smokies, shopping at the outlet malls in Pigeon Forge, or enjoying the attractions in Gatlinburg.